Question: How to create a heatmap of RNA-Seq Data in R? I would like to create a heatmap of these genes in the whole dataframe and also then create a heatmap with just selected number of genes in the dataframe in R.
ComplexHeatmap is a great R package to create heatmaps. You probably want to use a table of expression values, not stats. I found a way finally to create a heatmap for the RNA-seq data. But I how can I group the different samples into the 2 different groups and compare them, please? I have chosen to use the raw expression values as recommended. That post is a bit useful but very hard to understand, can you please give me some code examples? When you group observations, you're going to need to aggregate the values somehow. Pick an aggregation logic (mean/median/something that makes sense) and plot that. I do sense you're already losing sight of what's important when you plot a heatmap. When you group and plot an aggregate, your plot will in no way help derive insights into your data. It can only be used to visualize obvious disparities between the groups. Thanks RamRS for the insight. Stop adding new posts as answers unless you’re actually posting a solution to the question. Hi Guys, this is the heatmap I have created. Can you tell me please if this is biologically meaningful? Apologies, this is not an assignment. I just need help creating the heatmap. I just wanted your opinion on how it looks visually. We know essentially nothing about your experiment, how could we tell you what’s biologically meaningful? label your samples and then plot the heatmap. You should be able to tell it yourself if this is biologically relevant. Here I can see some faint signal but clustering of columns and rows needed to really see if you have a proper separation of your data across meaningful biological condition of interest. 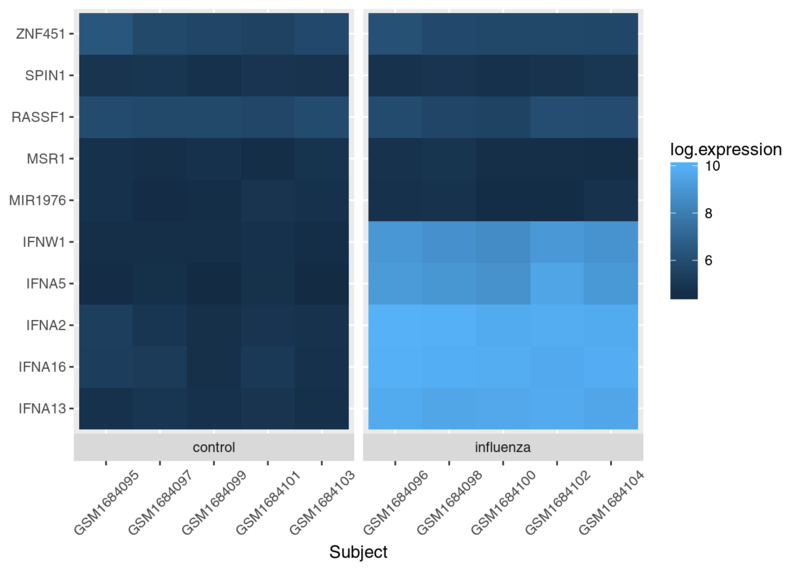 Again if you are new, scan the blogs well to see a tutorial, there are plenty floating in biostars and some amazing blog posts of real data using various R packages for heatmap visualization with code snippets. I would recommending searching for this - there are many tutorials and examples available. gplots' heatmap.2 function is very flexible and relatively easy to use. But I have to ask, what do you expect this heatmap to show you? It's going to just be a single column of log fold changes. Looking at actual expression values across samples would be much more informative. Can you give me example code please? As @RamRS said, there are many examples available through Google. Here is one with a simple example along with in-depth explanations to get you started. Start with just heatmap.2(x) and then, based on what needs to be customized, look for an optional argument that makes sense and change its value. Need a title for the plot? Add main = "Plot Title" to make the function call now heatmap.2(x, main = "Plot Title"). Repeat this exercise (using Google liberally) and you will learn "new" stuff the way most of us learn. 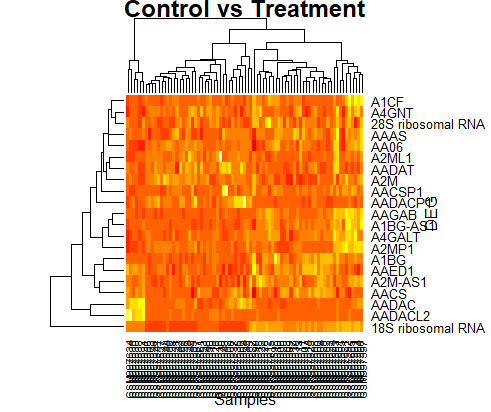 Hi all, I have created a heatmap in R but I am still having difficulties labelling the samples into the two different groups (Control vs Treatment)on the heatmapp with a key included. How can differentiate between the sample groups on the heatmap and also provide a key, please? Please note I am very new to this so if you can provide code examples, that would be greatly appreciated. The data as you have it right now is pretty wonky, given that you store information about the samples in the header. You will need to remove the Control/Treatment double header from your data, convert it from its current wide-form state to long-form (look into reshape2::melt or tidyr::gather, as shown here), then add a column that contains the Control/Treatment information and use that column with a facet function. Look into facet_wrap and facet_grid, that will get you to what you need. Please try as much as you can before asking us for code examples. How can I use this code to annotate the samples? The columns are in order. Please Google add column to data.frame r. You don't need a new metadata data frame, just a simple cbind. And make sure you're adding stringsAsFactors = FALSE to all read.table variants (which in your case is read.csv) unless you have good reason not to. Can differential gene expression heatmaps be compared across multiple separate experiments?